We are involved within the oven cleaning industry for many years, over which our main priority was to establish high standards and provide first-class cleaning for all of our customers in London. We managed to establish an efficient and innovative system of cleaning, which can erase every trial of grime and dirt in the safest way. For many years, some of the best restaurants in the area count on us for the cleaning of their kitchen electrical appliance. We must say that the real challenge is the commercial needs, but we always manage to tackle with the problem in the utmost way. We serve both commercial and domestic needs, but the results are always spick and span. We realise that the great results can be achieved only by hard-working and motivated people, and that’s why we have high requirements for our new members of the team. All of them pass through our extensive training, which provides them with knowledge of how to treat the fragile surfaces in the best way. Before we let them in your place, we test their abilities, so that we are sure in their best performance. Their results are enhanced with the help of the most modern cleaning tools, which are specially designed for the delicate enamel. The detergents we apply are only toxin-free, since the kitchen is the last place, where you need to stuff with chemicals. 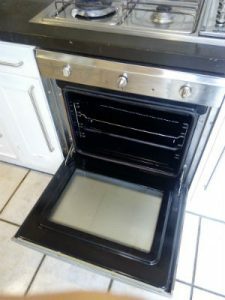 If you are in need of oven cleaning services in London, look no further, because we are the best choice. We stand among the others with our professionalism, unbeatable knowledge and unrivalled results. Your kitchen appliance is in safe hands with our experts. They know how to sanitise deeply, sticking to all the safety standards. They will strip the oven, cleaning it from the inside and outside, sanitising its racks and the door. When everything is dry, they will assemble the oven, polish it and try if it works in a safe way. Tenants Cleaning London © 2019. All Rights Reserved.